Carl Clerck was employed by the tax authorities in Stockholm. Inspired by Linnaeus, he started studying insects in his spare time. With time he also became a highly skilled butterfly painter, and his book of plates Icones insectorum rariorum from 1764 is a world-class work. Linnaeus, who vetted the paintings, exclaimed: “So beautiful I feel good down to my toes.” Linnaeus also wrote the species descriptions for the butterflies (Museum Ludovicae Ulricae 1764). The painting is from Clerck’s Icones insectorum rariorum 1764. Linnaeus came to be of great importance to the study of animals, and his work in naming, classifying, and developing the concept of species was just as important to zoology as it was to botany. Why didn’t his efforts in zoology attract as much attention? Any attempt to answer the question of why Linnaeus has been so one-sidedly associated with botany would have to admit that his animal system was more dependent on his predecessors. This means that his works in this field did not represent such a new departure as his plant system did. His way of systematizing animals also prompted major criticism even during his lifetime. On the other hand, his animal system was more natural than his botanical one, and he effected several major regroupings compared with his predecessors. One example is that he distinguished worms from insects and moved crustaceans to the insect group. Another reason for the dominance of botany may be that his contributions to zoology are more hidden in his works. Several of Linnaeus’ disciples also made major gains in the field of zoology. Thunberg, Sparrmann, Osbeck, and others researched the fauna of other parts of the world, and, just as with Linnaeus, these efforts have often been overshadowed by their botanical work. To understand his importance as a zoologist, it is necessary to know how chaotic research was at the time. Before the middle of the 19th century, all color pictures were filled in by hand, which was highly time-consuming and expensive, of course. When Clerck died, six copies of the work had been finished. The Royal Academy of Sciences took over, and a total of 60 copies were completed by 1797, when publication was terminated. From Icones insectorum rariorum 1764. Imagine a time when there were no particular rules for soccer, for example. Everyone played soccer in their own way. Some people used their hands, others had two goalkeepers, what constituted a goal was unclear, and everyone had their own idea of what a real soccerball was. There were no rules of play and no referees. That’s what the situation was like before Linnaeus’ Systema Naturae. 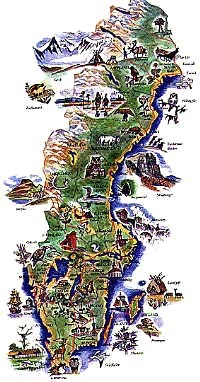 Linnaeus’ travels in Sweden. Lapland 1732, Dalecarlia 1734, Öland Gotland 1741, Västergötland 1746 and Scania 1749. Here you see the places he visited and animals and plants he saw. Watercolor by Gunnar Brusewitz. The same animal could be described by different zoologists under entirely different names. It was nearly impossible to know for sure whether an animal had already been described or if it was a newly discovered species, and there were many opinions about how they should be classified. In other words, what was needed was a set of fixed frameworks to hold together all the disparate facts that were going around. What was needed was a uniform terminology and a holistic vision of how nature was divided up and how these parts fit together. He personally came to concentrate his research on species descriptions, systematics, and faunistics. However, his vision of what natural history should be about was much broader. In 38 short clauses he laid down how one should go about studying and describing natural objects. This method, together with his system, became the solid foundation zoology needed to be able to develop further. See also Linnaeus’ method. Several of Linnaeus’ works were of great importance to the development of zoology. Systema Naturæ has already been mentioned. It was the most complete descriptive manual a naturalist could find. It was often found in the luggage of the itinerant Linnaean disciples, and it was indispensable for anyone wishing to organize their specimen cabinet in a systematic way. It ultimately set the norm for what name should be used for various animals. Fauna Svecica, which is a field handbook for determining the species of Swedish animals, appeared in two editions, 1746 and 1761. It proved to be instrumental in making natural history so popular in Sweden. For nearly a century it was the only descriptive manual available to anyone wishing to determine the species of an animal they had spotted. The first edition describes 1,691 species of articulated animals, and it might be worth pointing out that the number of Swedish plant species Linnaeus knew about at that time was limited to some 1,300. Besides these two works, mention should be made of all of his zoological treatises, which provide good insight into Linnaeus’ multifaceted zoological work. Linnaeus’ knowledge of animals was primarily systematic in character. When it came to the behavior and patterns of living of animals, he did not possess as much first-hand experience. This was not a result of lack of skill; on the contrary, Linnaeus had a highly developed capacity to observe, and his writings offer numerous examples of fine observations of the lives of various animals. However, anyone who has undertaken such studies knows how time-consuming they are. It is simply impossible for any one scientist to find the time to study many different animals in detail. What animal group did Linnaeus study most closely? It seems that insects and birds were his favorites. He says himself that insects were his greatest pleasure, and in his spare time he eagerly collected insects around Uppsala. After all, if you were studying plants, it would be only natural to be interested in all the creeping and flying creatures that are often found on them. It can probably be assumed that Linnaeus was not aware of the role of insects in the pollination of plants. In the twelfth edition of Systema Naturæ the number of articulated animals amounts to 3,000, most of them insects, and among these Linnaeus was the first person to describe 2,000. He based his species descriptions on his own collections, those of his disciples, and those of Queen Ulrika Lovisa at Drottningholm Palace and King Adolf Frederick at Ulriksdal Palace. Hofsten, Nils von, ”Systema Naturæ: ett tvåhundraårs-minne” Svenska Linnésällskapets Årsskrift 1935. Lönnberg, Einar & Aurivillius, Christopher, ”Carl von Linnés såsom zoolog” i Carl von Linnés betydelse såsom naturforskare och läkare (Uppsala, 1907). Nybelin, Orvar, ”Fauna Svecica 200 år”, Svenska Linnésällskapets Årsskrift 1946.